Join us on Mindworks Journey to greater well-being. Mindworks Journey guides you along a specially curated program of meditations, mind talks, blogs and other offerings designed to help you achieve a stronger meditation practice and experience a more open, kind and joyful perspective on life. The Journey is a complete meditation experience presented in nine clear, manageable segments. The Journey’s first three stages belong to the Foundation. They teach the basics of a healthy practice. Next, the three Path levels guide you through the obstacles that can prevent you from connecting with the mind’s true qualities. Finally, the Journey leads you to the last three levels of Transformation and a renewed sense of genuine confidence and well-being. Awareness: seeing what’s happening in your mind and environment with clarity, precision and equanimity. Thanks to the Mindfulness-Awareness continuum, you can take a step back and experience your life with a sense of space and openness. By truly appreciating how the mind works, you will be able to break the mold of your habitual patterns, work with your mind and experience genuine well-being. Each of the nine levels of Mindworks Journey takes you on a guided tour of rich content on the App and website. Best of all, it only takes 15–20 minutes of your busy day. 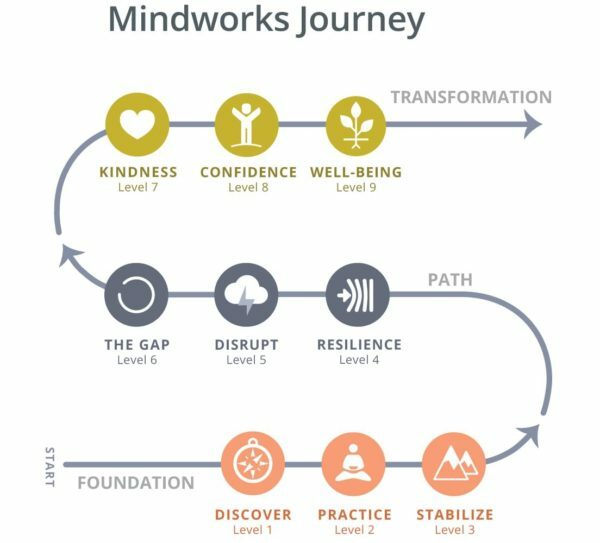 Get started on your Mindworks Journey—a progressive path to personal transformation and greater well-being. Meditation unlocks our potential for a happier, more meaningful life. Learn about the many benefits of meditation and become inspired to practice. Practice mindfulness regularly and begin to fully appreciate this very moment. Learn how to maintain mindful focus in everyday situations. Become more flexible and resourceful and face challenges with honesty and courage. Let go of habitual patterns and disrupt negative behaviors. Become aware of mind’s natural spaciousness and experience freedom of choice in responding to daily challenges. Awareness practice gives kindness and gentleness plenty of space to shine. Awareness practice builds confidence, humor and perspective. Awareness practice gives expression to life’s basic goodness.